It's an encouraging sign that Oscar is getting back to its roots. First, Billy Crystal will return as host of the Oscars for the ninth time next year, replacing Eddie Murphy, who departed in the wake of the Brett Ratner debacle. 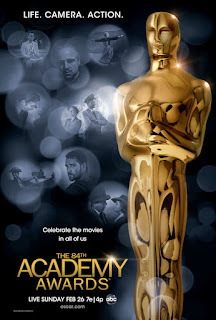 Second, the Academy of Motion Picture Arts and Sciences is paying tribute to its past with the release of the official poster for the 84th Academy Awards. 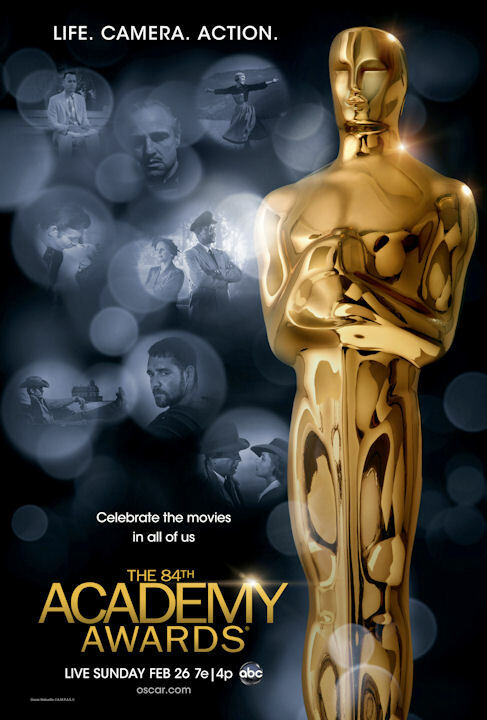 The poster shows a large Oscar statuette next to images from Oscar-winning films Forrest Gump, The Godfather, The Sound of Music, Gone With the Wind, Driving Miss Daisy, Giant, The Gladiator and Casablanca. The most recent film of the bunch (Gladiator) is 11 years old. This pleases me. I like the Academy Awards steeped in history. In recent years, the show has tried to be hip and modern to attract a younger audience. That approach never works. Hip and modern results in painfully awkward hosts like James Franco and Anne Hathaway. Give me traditional, thank you very much. Billy Crystal is a funny and entertaining pro and he's been sorely missed. Recall he got the biggest round of applause as a presenter during last year's Oscar show. Now, if the Academy would just make the presentation of the Thalberg Award and other honorary Oscars part of the telecast again, I'd be a happy movie fan. It's great to celebrate the best films of the past year, but it means nothing without honoring the history too. The 84th Academy Awards will be televised on ABC from the Kodak Theatre in Hollywood on February 26. Nomination ballots were mailed to the 5,783 voting members of the Academy this week. You can download the new Oscar poster at www.oscars.org/poster.